Artist Profile | Margaret L. Paris | Goldman & Minton, P.C. Margaret Paris is a writer and photographer who lives in the metropolitan Washington, DC area. Embracing America: A Cuban Exile Comes of Age, published by the University Presses of Florida, is her first book. She has exhibited photo media extensively for over thirty years in the metropolitan Washington, DC area and nationally in East Coast states and in California. She has a BFA and MFA in Studio Arts from UNC, Greensboro. NC and an MA in Humanities from Georgetown University. She taught in the Visual Arts Department at Duke Ellington School of the Arts from 1974 to 2003, Washington, DC’s arts high school, and as an adjunct at Georgetown University from 1986 to 2003. Presently she teaches workshops and classes in photo processes at local art centers. Goldman & Minton, P.C. was pleased to have selections of Ms. Paris’s extraordinary work on display until in the Summer of 2012. 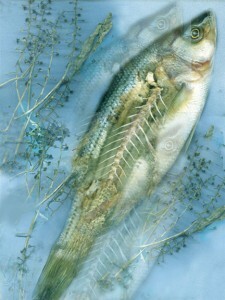 The works are from three series: Everglades, Evidence and Fish as Life. In the Fish as Life series I used a scanner as a camera, placing whole fish or parts of fish on the scanner bed. This series had its beginning in a very undeliberate way: I observed two friends eating a whole fish in a Chinese Restaurant. The skeleton intrigued me and they saved it for me. After scanning and making prints of it, I was pushed to consider what this skeleton could mean beyond the mere fact of it. Several weeks later I was in another restaurant and had razor clam risotto. I was most intrigued with the beautiful, organic form of the razor clam shells. The razor clam shells and the fish skeleton came together in my mind as I drove home. I knew that I wanted to work with fish. I found small whole fish were available from a near-by Korean market. Protects creative work of artists, writers and other creative professionals–online and off–in four steps. Learn more. Kathryn is now accepting new clients for certain fixed fee services, consultations and contract review. Found out more about how you can work with Kathryn for your legal needs. Goldman & Minton's offices are designed as an art gallery with an adjustable display system and museum quality track lighting. We have four shows a year curated by Ann Wiker at Art Exposure. Each artist whose work is displayed in our gallery is also profiled here.